What do the largest and most successful technology and online retails companies have in common? They work with a business model that is built on scalability, not growth. Small and mid-market companies should seek to understand how they can operate with a scalability in mind. This is key to financial and operational business success. Growth is when the resources that run a business grow at the same rate as its revenue. A business model built for growth is something from the pre-internet age where business operators literally needed to add more people (managers, cashiers, accountants, lawyers, marketers, etc.) in order to manage their physical operations. If the business is successful in one location, it could be replicated in another. Rinse and repeat for business growth. Actual profit will grow slowly as the business expands, but the resources needed to grow the business are significant and cut into additional profits. This is how old-school business worked. Scale is a business model that was born through technology. Instead of adding people, a business focused on scale will look for ways to increase the gap between revenue and overhead resources, finding ways to do more business with minimal growth in staff and resources. Any business that can scale like this will become much more profitable and outperform any competing business built on growth. The following image is a visual representation of growth vs. scale business models. The green lines showing gross revenue are the same for both, but increased operating expenses for growth directly impact the overall net revenue of this model, resulting in less realized profit vs. scale. A business built to scale will constantly be trying to find better and more efficient ways to do anything repeatable. Whether it’s integrating their ecommerce platform with other business systems (i.e. accounting, inventory management, CRM, etc. ), making processes as efficient as possible is the goal. As mentioned above, integrating your business systems so that they ‘talk’ to one another is important for scalable growth. The less you have to manually do is important, and the software of today was built to talk to each other. You want to take as much manual work out of the picture as possible and let system integrations take a front-and-centre role. If you suffer from swivel chair processes, manually entering the same data into multiple places, then you need to find ways to automate those processes instead. Like integrations, take the human element out of as much data entry as you can and let software do it instead. This not only saves a huge amount of time and resources, but also eliminates any chance of costly mistakes. The lower a business's bottom line is, the more capital it has available to adapt to change and invest in its own success. With more time and resources available, a business can focus more on its brand elements and how it’s positioned in its market. Customer experience is key to reducing support requests, retaining happy customers and gaining new ones. Efficient businesses can spend more time making sure its customers have the best experience possible. This goes hand-in-hand with customer experience. If a business has exceptional customer experience, less customers will require support request. If less customers require support, more time and resources can be put into the customers that do need it. With an increase in profit, more resources can be put back into the employee experience. Higher wages, better benefits and more team building exercises are just some examples of how businesses can retain their employees. Having more cash-flow lets businesses better prepare for downturns in the economy. Not only is there a greater chance of survival if and when economic downturns happen, but, by being efficient, a business focused on scale will also be able to responsibly retain employees instead of requiring mass layoffs to cut costs. While there are a lot of important pieces needed to complete the puzzle, the most important part that is central to any scalable business is its overall commerce architecture. Commerce architecture determines how all of the individual software components that make up the business align. Choosing the right type of architecture is essential for scalable growth. If the business gets this part wrong, its ability to be efficient, integrate and automate can be greatly restricted. Not only that, but it’s almost inevitable that at some point in the future, typically 3-5 years, a replatforming exercise will be needed as the limitations of the less-than-ideal architecture start to surface. Depending on type of business, the ideal commerce architecture, in our opinion, is either “Content and Commerce” or “Headless”. Content and Commerce is an architecture that is focused on the customer experience, with an integration friendly content management system and ecommerce platform at the forefront. Headless is an architecture designed to support maximum agility and adaptability. It gives businesses the freedom to piece together all of the individual components at-will, and can then swap out pieces later as needed. When we engage with new clients, the advice we often give is to “focus on your commerce architecture, not your platform.” Shopify is a common platform where we see businesses hitting limitations. While this platform is great for many small businesses, once you hit the mid-market range (roughly $10+ million in sales), the fees and limitations of the platform really start to hinder the businesses ability to adapt. Businesses end up working around the platform instead of forging their own path forward. 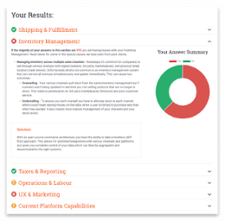 Acro Media has developed a Digital Commerce Assessment Tool that will help you pinpoint the problematic areas of your backend operations, and deliver valuable diagnostics to help you understand the root cause of your pains. With this knowledge you are able to move towards creating streamlined workflows for effective operations and scalable growth that ultimately increases your bottom line.